2016 is YOUR year to make YOUR mark and meet YOUR goals. It’s finally here, 2016, time to take over your life and do something for yourself, your kids and your family. At Running For Your Life Personal Training we want to help you meet those goals. We personalize our training to each individual’s needs while motivating and pushing you to a new level. Our Coaches are there from start to finish and are there with you along the whole journey. We specialize in kids bootcamps designed to get them fit, while having fun and increasing their confidence and self esteem. We offer Nutritional Counselling as part of this program as we believe nutrition and fitness go hand in hand. 10 week sessions available for Kids and Ladies Bootcamps. Sign Up Now for 10 week programs. the correct bio mechanics for running. You can jump higher, kick the ball further and improve your overall physical ability for your sport. At Running For Your Life we use drills,strength training, speed strategies and mechanical analysis to get each athlete performing at their optimized level. Achieving peak performance and competing at a high level is a skill set that doesn’t happen over night. The Peel Gazelles is a Track and Field Club that helps athletes develop their skills by teaching them the correct biomechanics and mental strategies of running, field events and competition. Once an athlete achieves awareness of their own biomechanics and mental confidence the sky is the limit for them on or off the track. Headed by Gold Medal Olympian Carlton Chambers. At Running For Your Life we have several different programs that will meet your families needs. 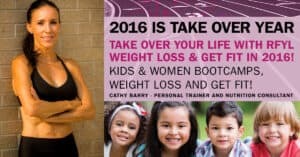 Check out all our programming to enhance your lifestyle for 2016 and Beyond! !